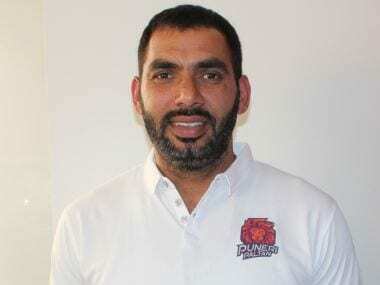 Visakhapatnam: Continuing their winning streak, title favourites U Mumba thrashed Dabang Delhi 44-19 in a completely one-sided affair of Pro Kabaddi League (PKL) at the Rajiv Gandhi Indoor Stadium on Tuesday. Once again, U Mumba witnessed an all-round effort as its raiders and defenders put in a convincing display. Siddharth Desai (12 points) and Rohit Baliyan (8 points) were excellent whereas skipper Fazel Atrachali got a high five and Surender Singh with four points marshalled the defence superbly. Delhi struggled to get going against a robust opposition and none of their players had a standout match. Meraj Sheykh had a match to forget for Dabang Delhi as he failed to get off the mark. Despite the defeat, Dabang Delhi remain in the hunt for a place in the playoffs. Rohit got U Mumba off to a quick start with two raids in two minutes to see them lead 4-1. The first half saw Chandran Ranjit pick up a couple of raid points and no other raider from Dabang Delhi could get going. It was Dabang Delhi's defence that kept them in the first half. For U Mumba, Rohit Baliyan was in fine form and Surender made crucial tackles at the back. U Mumbai inflicted the first all out of the match in the 16th minute to lead 16-8. It was an impressive first half display from U Mumba as they went into the break leading 19-11. Dabang Delhi were on equal footing at the start of the second half as they matched U Mumba point for point but still trailed 15-23 after 27 minutes. 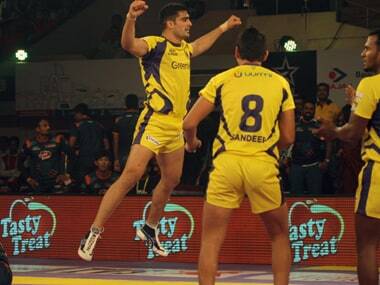 Siddharth successful raid in the 30th minute led to another all out as U Mumba led 30-15. After the second all out of the match U Mumba completely asserted the dominance. Delhi surrendered haplessly as in the last 10 minutes they could score just four points. U Mumba inflicted another all out in the last five minutes and registered a comfortable 44-19 win in the end.